The use of Rubber as a material for Castor Wheels has been in existence for more than a century. Produced from the naturally occurring Latex of the Para Rubber Tree, Natural Rubber has become a common material within the Castor Wheel Industry. In more recent times, Synthetic, Manmade Rubbers have been developed to simulate the properties of Natural Rubber with the addition of other specific mechanical properties, such as Oil Resistance, which Natural Rubber does not offer. However, scientists have been unable to fully emulate the full extent of the properties of Natural Rubber, and therefore Natural Rubber is still the material of choice for many applications. Permanent Set is a characteristic of most rubber materials. It is usually seen as an unfavourable characteristic, particularly within the Castor Wheel Industry, that should be controlled and kept to a minimum. What is Castor Wheel Compression Set? Compression Set of a material is defined as “The Permanent Deformation of a Material after a Force has been Removed”. It should also be noted that the opposite is possible, called Tensile Set, where the material has a Tensile Force applied and any Permanent Deformation is considered as Tensile Set. Lastly, it should also be noted than both Compression Set and Permanent Set can be referred to, interchangeably, with the term “Permanent Set”. Castor Wheel Compression Set is a undesirable characteristic whereby a wheel develops flat spots (permanent change in shape). Imagine a Trolley, mounted with four Rubber Castor Wheels. The Trolley is carrying 100Kg of Goods/Equipment. This 100Kg applies a force to the Rubber Wheels, which in turn deforms the Rubber Wheels, let’s say by 6mm. When the Goods/Equipment are removed from the Trolley the deformation on the Rubber Castor Wheels will recover. Any “Non-Recovery” is considered permanent Set. So, using the above example, when the 100Kg Weight is removed, the wheels recover, let’s say by 5mm, leaving a 1mm Permanent Set. The Causes of Castor Wheel Compression Set are mostly due to the formulation of the rubber compound. If the end user is using a reputable Castor Wheel manufacturer, the Control on Compression Set will have been taken into account when the rubber compound was formulated, and therefore the end user should focus on how Compression Set will “Effect” performance, rather than the “Cause”. Rubber, whether Natural or Synthetic, comprises a molecular structure of Long Chain, Cross Linked Polymer Molecules. Simply put, the molecules of the rubber, which are all linked together, are randomly arranged and randomly linked. They are not aligned or linked in a uniform manner. When Stress and Strain is applied to the Rubber material these randomly arranged molecules will extend, compress and change position. Each time Stress and Strain is applied to the material the arrangement of molecules will change. These randomly aligned and linked molecules are the basic feature of a “Visco-Elastic” material – a material that can both store and dissipate energy. This Visco-Elastic property is relatively unique amongst Polymers, where the Viscous property of the material absorbs and dissipates energy (ideal for shock absorption), whereas the Elasticity of the material stores and rebounds the Energy (ideal for wheels rolling over rough ground). Below you can see a “Load vs. Compression” graph for a Visco-Elastic Material. 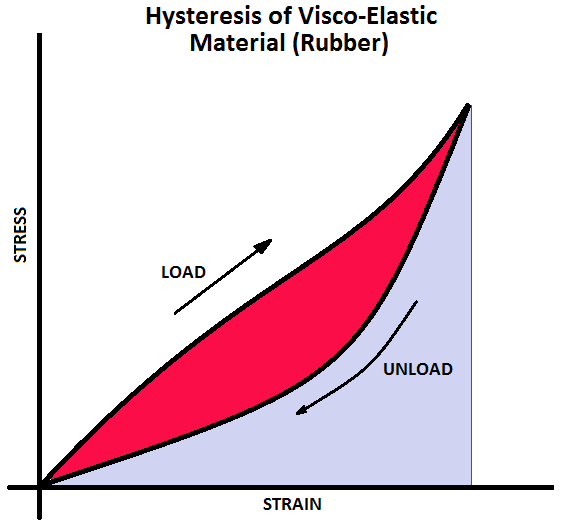 As can be seen on the graph, the deformation of the Visco-Elastic Material follows a different path on the “Load” and “UnLoad” cycle. The Unload cycle shows that the materials deformation is slower to recover compared to the Load Cycle. This difference in recovery is known as Hysteresis, which is due to Energy Dissipation by generation of heat. This Hysteresis is an important factor when considering Castor Wheel Compression Set. – Further details on Hysteresis can be found HERE. Now, back to Compression Set……..
HYSTERESIS – The Formulation and Rubber Type will affect the ratio between the “Visco” &. “Elastic” properties of the material. A Natural Rubber Compound may have a Low Level Hysteresis (Visco) Level of between 5-15%, whereas a Butyl rubber may have a Hysteresis (Visco) Level between 25-35%. A high level of Hysteresis, and hence its inability to recover at the same speed, results in energy being converted into heat and ultimately the potential for the rubber not to fully recover. It should be noted however that for Testing & Quality Control purposes, whilst Hysteresis measurement is a good indication of the possibility of Permanent set, it is possible that some rubbers will fully recover after a short period of time. It can therefore be considered that Hysteresis is a “Indicator” for potential Castor Wheel Compression Set. FILLERS – Raw Polymer is Highly resilient, however in its raw form many of the required mechanical properties, such as Tensile Strength and Abrasion Resistance are poor. Therefore, the Raw Polymer is mixed with other materials (known as Fillers). 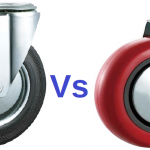 The types and percentage of Fillers have a major impact of Compression Set on Rubber Castors. The Most Common Filler is Carbon Black. It is known as a reinforcing filler and provides excellent Tensile Strength and Wear Resistance and many other beneficial properties required for Castor Wheels. However, other fillers are available (such as Calcium Carbonate or Clay) which are normally used to reduce the cost of the Rubber Compound and can increase the Hysteresis percentage. Unfortunately these variations in material do not normally change the appearance of the material, making a High Quality Castor Wheel and a Low Quality Castor Wheel look identical. In summary, “High Levels of Filler”, “Particle Size of Filler” and “Type of Filler” all contribute to the level of Permanent Set on Castor Wheels. In the example at the start of the article (Trolley with 100Kg Load), if the Trolley is stationary for a few minutes, the Permanent Set will be minimal, whereas if the Trolley is stationary for a longer period (weeks/days/months) then the likelihood of Compression Set increases. In addition the level of Stress and Strain on the Rubber Wheel will affect the level of Compression Set. If the rubber is low compression strain (for example 2%) the possible Compression Set will be minimal, whereas if the compression strain is high (for example 20%) the possible Compression set will be much higher. Compression Strain can be reduced by either reducing the weight on the Castor Wheel, or increasing the size of the Castor Wheel. TEMPERATURE – The operating temperature of Natural rubber is between -40ᵒC to +80ᵒC, whereas common synthetic rubbers, such as EPDM used for Castor Wheels can provide temperature resistance between -40ᵒ to +125ᵒ, and there are special compounds that can be used up to +300ᵒC. Firstly, if the material exceeds the Minimum or Maximum Temperature range (particularly the Maximum), the rubber compound will deteriorate and degrade, potentially causing surface cracks. Ultimately these irreversible changes result in reduced strength and Permanent Set. Secondly, if the material is used within its operating temperature, but at the higher end, the Rubber will reduce in hardness. Whilst independently this reduction in hardness doesn’t cause any problem for the material, it will result in increased Stress & Strain of the Rubber Wheel, due to reduced stiffness, and therefore the above comments on Stress & Strain Levels apply. CURING (VULCANISATION) – Rubber Wheels are usually manufactured by a moulding process, such as compression moulding. As mentioned above, in addition to the Raw Rubber, Additives & Fillers are mixed together to improve the properties and aid the manufacturing process. One of these Additives is Sulphur which is used as a Curing Agent. Before a master batch of a specific rubber formulation is produced a sample specimen of the material should be cured in a Rheometer. A Rheometer is a machine which cures the rubber specimen to determine an accurate moulding temperature and time period to fully cure the rubber. Firstly, some manufacturers, particularly in low cost countries cannot afford the expense of a Rheometer, which can typically cost between £30-50000. This means that the correct temperature can time period cannot be scientifically determined and the cure time and period will be estimated based on operator experience and/or trial and error. Secondly, in order to reduce costs, manufacturers increase the moulding temperatures in an attempt to reduce the moulding time to increase productivity. This almost certainly will result in an inferior product. ENVIRONMENT & CONTAMINANTS – The environment that the Rubber Castor wheels are used can also affect Compression Set. Natural Rubber is particularly susceptible to UV & Ozone, and whilst additives are mixed with the rubber to improve resistance, UV & Ozone can attack the rubber resulting in reduced strength and permanent set. There are many other contaminants that can effect rubber negatively, too many to list here, but they include solvents, fuels, oils and fluids. THE IMPORTANCE OF COMPRESSION SET ON CASTOR WHEEL? Castor Wheel Compression Set may occur due to Poor Quality Materials, Manufacturing Defects or Incorrect Use of the Castor Wheel. Regardless of Cause, the result is a permanent deformation in the wheel (such as a flat spot). Once this set has occurred the Roll Resistance of the Wheel will increase considerable, possibly making the wheel inoperable and increasing user effort. Ultimately it will result in the requirement to replace the wheels which could possibly be a cost and timely exercise. How is Compression Set Defined & Measured ? As discussed above, most rubber compounds look identical in appearance, regardless of material type, formulation and quality. It is therefore important that as a manufacturer there are controls in place to specify and test the mechanical properties of the rubber wheels. This should include simple properties such as “Rubber Hardness” and “Wear Resistance” to more complex properties such as “Hysteresis” and “Permanent Set”. Within ASTM D2000-12 all manner of mechanical properties and test methods can be specified to ensure that a rubber product has controlled mechanical properties that can be repeatable and measured using standard test methods. ASTM D2000-12 is an extremely details standard, but ultimately results in a code, called a “Line Call Out” which determines all of the required properties of a product. – You can read our article for details information HERE. Within the ASTM D2000-12 one of the properties is “Compression Set”. The maximum allowable levels of Castor Wheel Compression Set can be specified using ASTM D2000-12, and the relevant tests are specified in the related standard ASTM D395. ASTM D395 specified a Compression Strain & Time Period for the Test. Is the Wheel being used within its temperature range? Does the Castor Wheel need replacing due to age? Assuming that the above 4 answers can be answered positively, then it should be considered that either the Castor Wheel material is not suitable for the application or the quality of the rubber wheel is inferior. 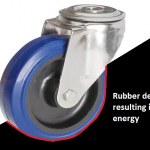 As experts in Polymer Engineering Bulldog Castors have an extensive knowledge on the formulation of rubber polymers, the best additives, fillers and materials. In addition we calculate the stress and strain limits to ensure that the rubber is used within its optimal working range. If you have problems with Castor Wheel Compression Set contact Bulldog for Expert Advice. Disclaimer: All information is provided for guidance only, and as such no reliance should be made upon the information provided. Our Standard Terms and Conditions of Sale apply to all orders.